Backpacking in Iran: Top 10 Sights in Kerman, including the Jameh Mosque. 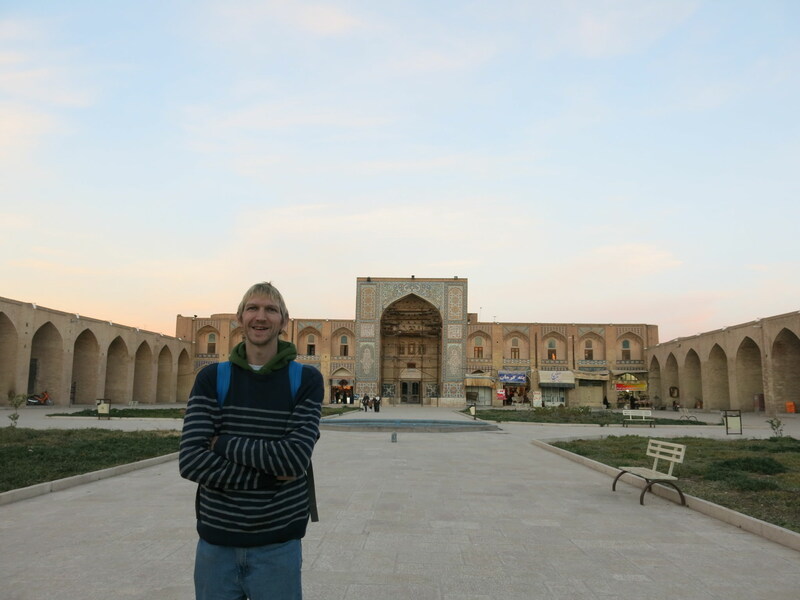 Kerman is never going to be the most obvious Iranian city you visit. But that’s not to say you should leave it off your itinerary. While a lot of people use Kerman as a gateway to the desert or en route to Pakistan, others find solace in the variety of sights around the city. You can walk yourself around the city centre area easily, but organising a local driver for cheap to take you to a few sights further out is recommended. We paid 70,000 Rials for a driver to take us on a tour which included a few of these spots. The others, we walked to ourselves. 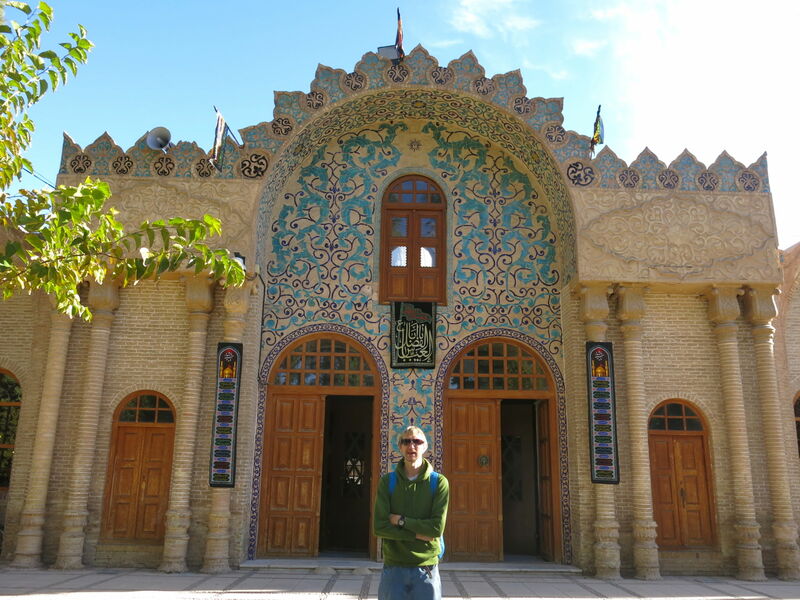 My top 10 tips when backpacking in Kerman, Iran. 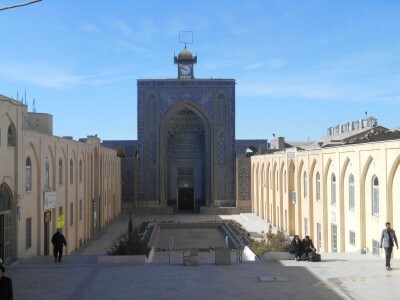 A long bazaar graces the city centre of Kerman. From the entrance near Shohada Square, walk yourself right through the market here. A wide variety of stalls and shops sell hot food, fruit, vegetables, meat, jewellery, clothes and just about everything that markets in Iran are typical of. 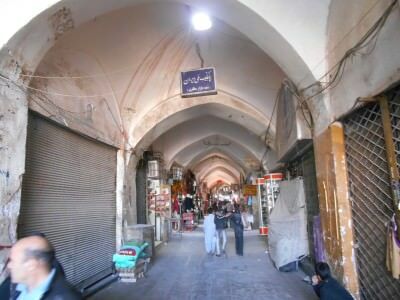 Take a walk along the massive end to end Bazaar in Kerman, Iran. A library with a stunning entrance and front, complete with alcoves lining the wall make this a decent spot to stop off at to admire. 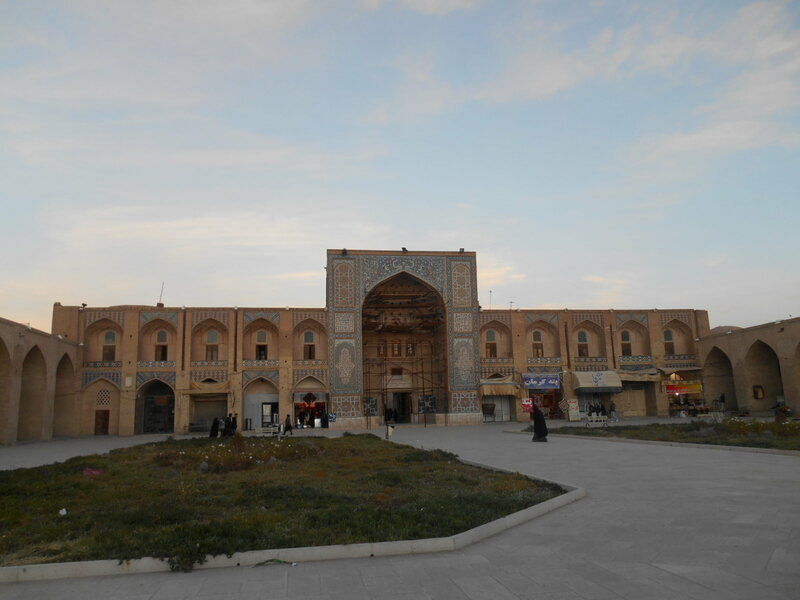 Every big town or city in Iran has a Jameh Mosque and they vary from town to town. Kerman’s one sits pretty and untouristy just off Shohada Square. It’s an easy place to check out. As ever, remove your shoes to go inside. 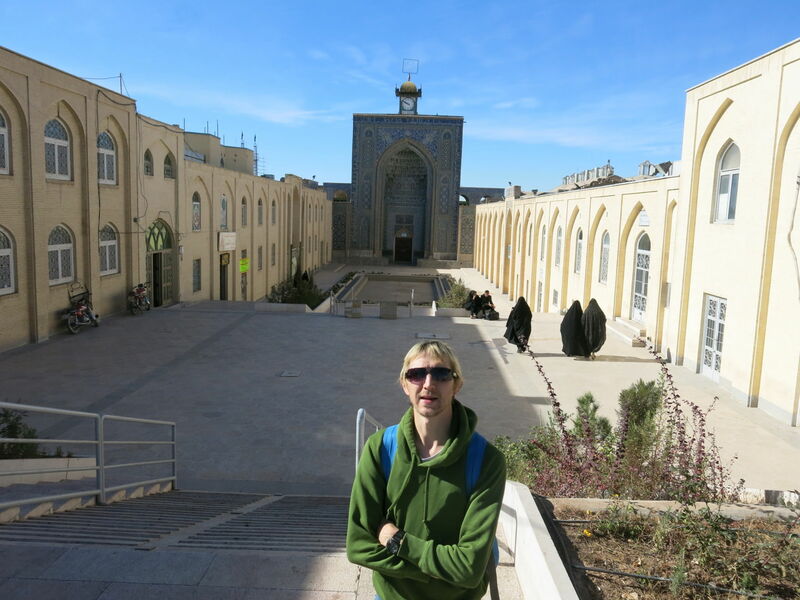 Backpacking in Iran: Checking out the Jameh Mosque in Kerman. This unusual and remote octagonal building is somewhat of an enigma. Locals are unsure of its purpose, with rumours that it was once an observatory or a tomb. These days it’s a museum and a stand out building to admire on the edge of the city. Get your driver to take you out to it for a peek. Checking out the octagonal Gonbad-e Jabaliye in Kerman. On a rugged rocky mini mountain on the edge of town sits a once spectacular fortress. There’s a telecommunications tower on it these days and you can’t really access it – viewing from afar is your best bet. Awesome views of the fortress in Kerman, Iran. Yes, peculiar place names are the norm here in Kerman. This obscure looking building appears to be built of brown brick on first impression. Up close, you’ll see it’s made of hardened mud. It’s a massive structure which was once used to store ice. Well in a desert city, with a low level of rainfall it makes sense. Nowadays the place doubles as a museum, art gallery, tourist information centre and a mini theatre. 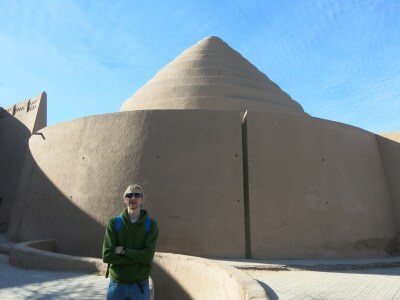 We’ll use the easy name – me at “The Ice House” in Kerman. Yes – to even things up there is a fire house here with an equally quirky name. 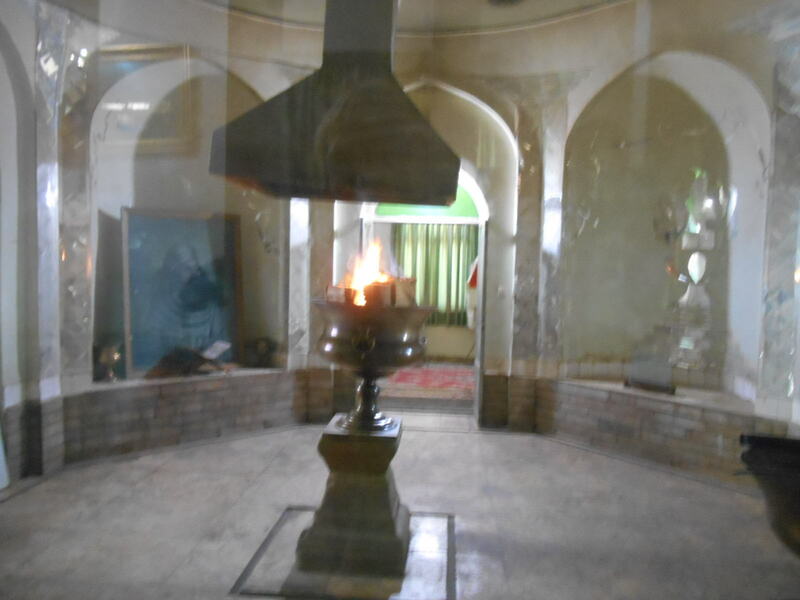 In a Muslim country, a never ending fire sits in the middle of this house. In a separate building sits a less than exciting museum. Check the fire out but give the museum a miss. The fire that never goes out. 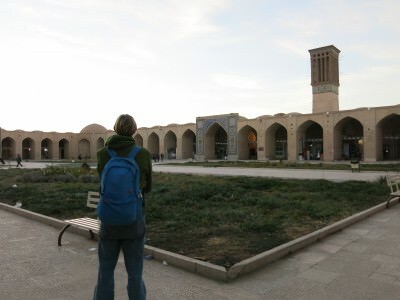 This term “caravanserai” is something I’ve got used to recently while touring cities and towns that were once on the “Silk Road”. We stayed in a Caravanseri in Seki in Azerbaijan. Here it’s a glamorous looking courtyard that houses shops and a museum. The Caravanseri in Kerman, Iran. This is a tea house inside a former bath complex. On your travels, this makes an excellent place for a culpa. Locals will come over and chat away to you as you sip tea. 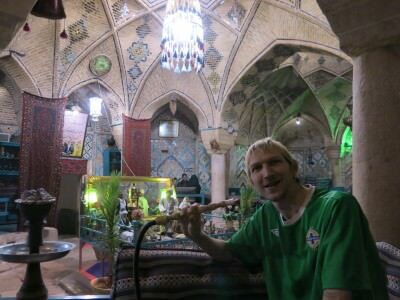 We also indulged in smoking some shisha and a local guy gave me some of his (alcohol free) beer. Such a relaxing tea house in a well decorated room. You need to pay 5,000 Rials to enter, but remember that’s about $0.05 so no worries there! Tea costs 10,000 Rials and up and the Shisha is 70,000 Rials. Enjoying some shisha and tea in a former bath house. Hamam is the word for bathhouse in parts of the Middle East and this one is Kerman’s oldest Bath House. However it’s no longer used as a place to bathe, so you can head in and check out a “Bath Museum” instead. Unique in itself and worth checking out. 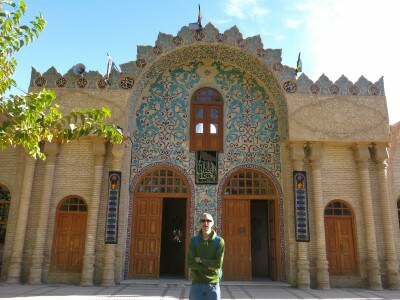 Also check out the bath house in Kerman. When I arrived in Kerman by train from Mashhad I had no idea, I would be able to make a list of top 10 sights in the city, but there you go. There’s a few other spots I missed out too, so this city is definitely under estimated by backpackers. 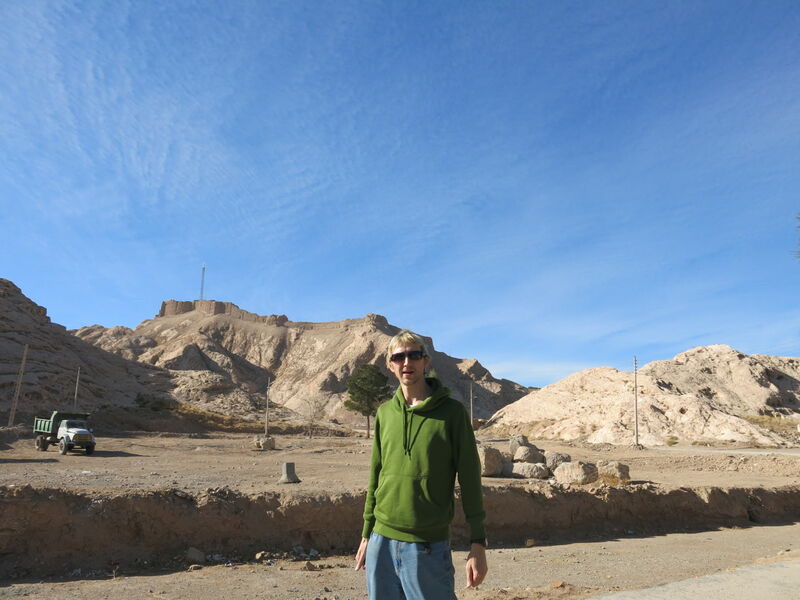 Outside the city of Kerman, we also did day trips to Mahan, Rayen and Kaluts. 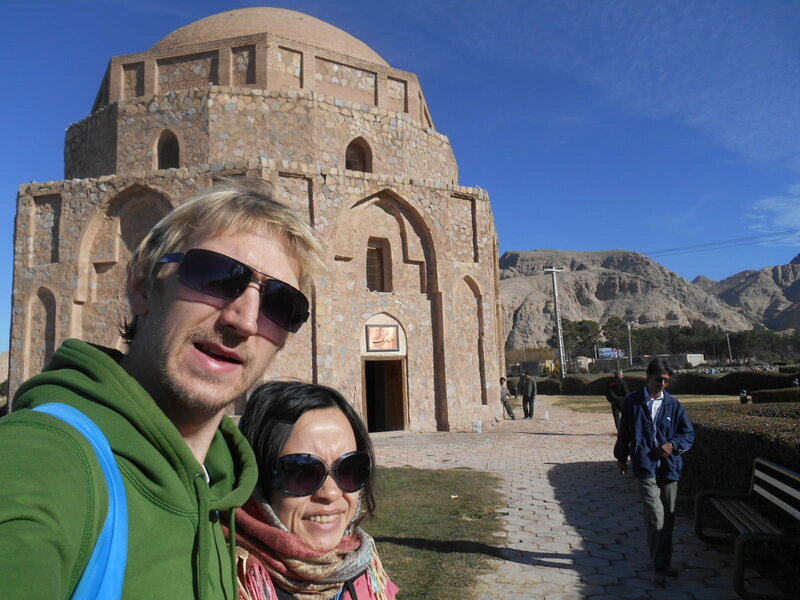 Backpacking in Iran is rewarding for sure, if you need to know how to get an Iran Visa or getting an Iran Visa Authorisation code check those links. This entry was posted in Central Asia/Middle East, Destinations, Iran, Kerman. Bookmark the permalink. I have seen Jameh Mosque in various parts around India (New Delhi/Kerala) too. Funny how there is no recorded history of Gonbad-e Jabaliye. Jameh mosques are the mosques that people (at the end of the week) goes there and prey . ofcours in any other mosques can people prey,too. But the jameh mosques are the first choice (( the most importent mosque between the others)) and of cours its the place which Imam jomeh commes and speaks about religion. Hope U had a great trip. At the next time visit the north of Iran ,too.